One of the constant questions I ask myself is “Where are we in the business cycle? And, how much time does it have left?” Employment and GDP growth look great now and, as humans with a positive attitude, we’re inclined to think the good news will continue indefinitely. But the problem we have at this late stage in the cycle is the Federal Reserve will soon be raising rates to the point where they will be generating a great deal of pain to the economy. As sure as the sun will rise in the morning, the Fed will push the economy into recession. The rising stock market acts like a slight of the hand trick distracting us with strong momentum and keeping our attention away from the Treasury bond market. The continuing shrinkage between the yields of the 2 and 10 year Treasury bonds are telling us that we are soon to be at the peak of the business cycle. There is no immediate danger right now as risk assets like stocks, commodities, real estate and crypto’s could have another 6 to 9 months to run higher. For those of you who are new or have never experienced a cycle peak as an investor, I’m not talking about an ordinary garden-variety market pullback but something on the order of 3x to 4x of the January decline. These cycle peaks are not to be ignored as risk assets are frequently crushed. I realize this sounds ghoulish and fearful but it’s real. To be frank, from the investment point of view, it’s the necessary transition from an old Bull Market to a new Bull that can last for years. The fulcrum point which could tilt the balance from stocks to bonds will be handled with care as my goal is to continue the growth curve of your accounts by adapting to a changing environment. As I’ve mentioned in previous letters, I may anticipate a major move in an asset class but I want to see price confirm my suspicion before I act in force. Many an investor goes broke trying to predict what may happen; I prefer to wait until price confirms my thesis. The best investors in the world have the ability to adapt and conform to whatever environment they face. Passive Indexing, Buy and Hold strategies and those not paying attention are reliant on a rising Bull Market for gains. That’s not the case with RMHI. As an active manager on your behalf, I look at recessions as an opportunity and will reconstruct your investment portfolios to prosper in the coming Bear Market. A business expansion period can last for most of a decade. In contrast, the cycle peak-to- trough is usually about a year. In other words, risk assets fall a heckuva lot faster than they rise. There hasn’t been much to say recently as the markets chop up and down with modest net progress. Long term trends for stocks remain positive but there are new signs of life in Treasury Bonds. Everyone, including myself, was looking for higher interest rates in January but I believe that moves to higher rates are over and a reversal to lower rates is emerging. The move to lower rates has likely been magnified by Italy but the closing gap between the 2-year Treasury Bond and the 10-year has been an ongoing trend. The Nasdaq Composite Index remains the strongest market index as it contains the highest percentage of the best growth companies. In addition, today (June 1) the Nasdaq is breaking out of its May trading range and could be the first of the major indices to reclaim the January peak. So I’m maintaining a higher than average percentage of client assets in Technology as it remains one of the strongest industries (aside from Oil and Gas which of course we don’t touch). The focus of this client letter is the price behavior in Treasury Bonds and the impact of the world’s Central Banks shifting their policies from pro-growth to restrictive. They’ll likely be very problematic for the economy and stocks in six months to a year. 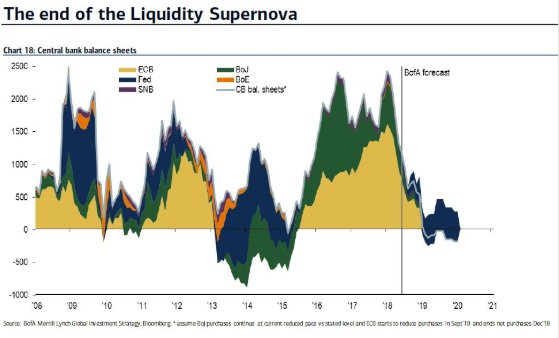 As the chart below reveals, the world’s central banks are acting in unison. By 2019, the world central banks will be initiating a global slowdown in growth. Its quite possible that the reversal in Treasury bond prices is a nascent trend that could bring interest rates much lower which in turn would trigger the infamous “Inverted Yield Curve” (IYC). The IYC is a wonkish term to mean that short term interest rates are higher than long term interest rates. IYCs have an impact on consumers since it forces those with adjustable rate mortgages to pay more than fixed rate. The same holds true with lines of credit. This chart above is a long term chart that does a nice job of revealing the long term trend in long term bonds. The blue line is a 48 month moving average and it conforms to the upward trend. But this month the price of long term Treasury Bonds jumped 2% and is right on the trend line which tells me that all the talk of rising rates is probably wrong. Plus, given the trends in the Yield Curve which are becoming more ominous, there is a very good chance we’ll begin to buy long term Treasury Bonds in anticipation of a weaker stock market and recession in 2019 and 2020. It’s a cold truth that every Bull Market will be killed by the Federal Reserve and that includes the Bull Market that exists today, which leads us to this point in time. The next chart is a graph of the “Yield Curve”. Its a common occurrence that before recession induced bear markets, the Yield Curve inverts. The Yield Curve has inverted ahead of every recession in the past 40 years. How much money and grief would investors save just by tracking this bit of data? The Yield Curve is calculated by subtracting the yield of the 2 year Treasury Note from the yield of the 10 year Treasury Bond. Today its 2.83% – 2.40% = .43% as seen in the chart below. Look on the chart above to see how the Yield Curve behaved in 1998-1999 and 2006-2007. By the time the curve turns upward, it’s too late as the damage will be done and the Fed will try to reverse course. US Monetary Policy is the primary reason we have Bull Markets and Bear Markets for almost every asset class. As the chart above reveals an inverted yield curve has been an excellent forecaster of incoming recessions. There is a lag time of 6 to 24 months between inversion and recession and we can’t be fooled into thinking “this time it’s different” that a recession won’t occur. The yield on the 2-year Treasury Note is based on the Federal Funds rate which is controlled by the Federal Reserve. See chart below. The Fed is stair stepping rates higher and has plans to raise rates by .25% two more times this year. Assuming the 10-year Treasury Bond yield stays put, those rate hikes could cut the margin by .50 and down to -.05% (Yield Curve Inversion). When the yield on the 10-year Treasury and the 2-year T-note are equal or inverted it becomes a giant alarm to run and not walk to the stock market exit. During this period we will sharply reduce are stock holdings to pare down risk. In the past 3 months we’ve head a series of declines in the S&P 500 Index which stopped right on the 200-day moving average (DMA). In a Bull Market we may hedge against the index falling below the 200 DMA but the odds are not very good for major break below. When monetary policy (meaning the Fed hiking rates) becomes very aggressive, as might be the case in 2019, I would expect a decline back to the 200 DMA followed eventually by a major break below the average and an additional decline of 25% to 40%. This sharp break below the 200 DMA is the trigger point for me to increase exposure to Bear Market related strategies and keep our stock holdings to a minimum. This next chart below, produced by the St. Louis Federal Reserve, is their own projection of where the Fed Funds rate might be in 2019. They’re projecting the Fed Funds to be a 3.4% late in the year which is well above the current yield of the 10 year Treasury bond of 2.83%. On the bright side, and there is a bright side at least for the time being: Employment. Historically, unemployment claims start to rise at least 7 months before a recession and there’s no sign of that now as the chart below illustrates. Summary: The present data is supportive of a continued market rally in equities and of economic expansion. But looking six months ahead there is concern that we could be dealing with a stock market and business cycle peak. We’ll be prepared to shift from Bull Market positioning to Bear Market strategies in all portfolios. The primary trigger will be a decisive move below the S&P 500 200-day moving average. In the meantime, enjoy the summer and the next leg of the rally.